I’m back from a much needed couple of weeks away from blogging and other tasks that are not directly related to family. I have finally learned one lesson in these past couple of years of activism and that is to take time off when I need to. Now if I can just learn not to over-commit. I’ve disappointed myself and a few others lately by allowing a few balls to drop in the complex juggling act I attempt from time to time. So to catch up — the most important development in the last couple of weeks from my perspective is the announcement of the Women Say No to War campaign that is collecting signatures to be delivered to representatives of the U.S. Government in D.C. and around the world on International Women’s Day. Along with the call to end the war there will be gatherings of women across the country and around the world to demonstrate their opposition to the war in Iraq and publicly call for peace. 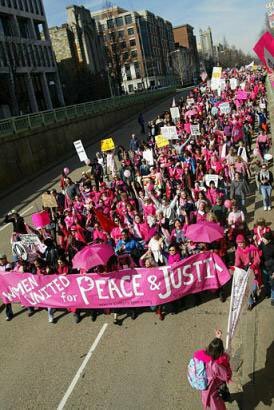 Three years ago on International Women’s Day thousands of people dressed in pink for peace marched in Washington D.C. to protest what we now know was an orchestrated and long-planned invasion of Iraq. The participation in the march was so great that CODEPINK, which was created just to be accompaniment to a vigil begun in November 2002. Meetings hastily called after the phenomenal turnout determined that an organic process was unfolding and CODEPINK happened to provide the niche for the needed process to “colonize.” As such recent acts of peace by women typify a new expression of a long-standing movement (not an organization as such) by the women of the world to exert influence in their governance by advancing peace. We, the women of the United States, Iraq and women worldwide, have had enough of the senseless war in Iraq and the cruel attacks on civilians around the world. We’ve buried too many of our loved ones. We’ve seen too many lives crippled forever by physical and mental wounds. We’ve watched in horror as our precious resources are poured into war while our families’ basic needs of food, shelter, education and healthcare go unmet. We’ve had enough of living in constant fear of violence and seeing the growing cancer of hatred and intolerance seep into our homes and communities. This is not the world we want for ourselves or our children. With fire in our bellies and love in our hearts, we women are rising up – across borders – to unite and demand an end to the bloodshed and the destruction. – Consideration of a temporary international peacekeeping force that is truly multilateral and is not composed of any troops from countries that participated in the occupation. To move this peace process forward, we are creating a massive movement of women – crossing generations, races, ethnicities, religions, borders and political persuasions. Together, we will pressure our governments, the United Nations, the Arab League, Nobel Peace Prize winners, religious leaders and others in the international community to step forward to help negotiate a political settlement. And in this era of divisive fundamentalisms, we call upon world leaders to join us in spreading the fundamental values of love for the human family and for our precious planet. Things will be happening here in Tucson on March 8th, and I can only hope that this will be mirrored in hundreds of cities around the country, and planet. Women say no to war. Can it be any more clear or simply stated than that? 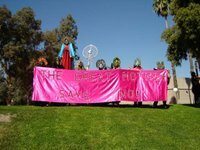 Women in Tucson last year, in March 2005, invoked the Goddess, in all her forms, just about a year ago with a similar statement and action to contain Bush’s agenda. 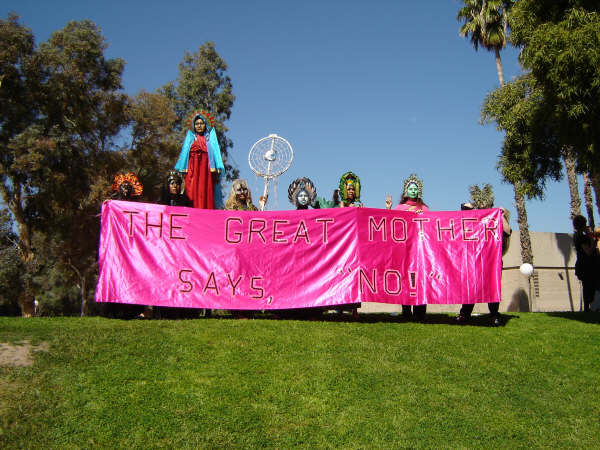 In that action, women wearing masks created by Lauren Raine invoked the Goddess and marched to and around the Tucson Convention Center singing and holding a banner that read, “The Great Mother Says, “NO!” where Bush appeared to give one of his canned audience performances. The theme that women must be the ones to bring sanity to the world through peaceful equality reappears time after time through a myriad of expressions. Let us hope this coming one will be the one to truly take hold and grow.